Deliciously beautiful wedding stationery is one of my most favourite things… and today I wanted to show you some of the very best. I love to celebrate the work of British designers and crafters: we have some amazing talents in our wedding industry and Emma Jo is one of the best. If you’re looking for a reputable wedding stationer with styles for all tastes and the sort of dedication and passion which guarantees fabulous customer service… then today’s English Wedding Blog feature is especially for you. Emma Jo is a small but perfectly formed design and print studio dedicated to good, honest design for paper lovers. I offer a diverse and ever expanding collection of invitations, save the dates and all the coordinating stationery you could ever wish for. Emma Jo was established in 2009 by designer Emma Prescott to provide a friendly, relaxed experience for couples that want something a little less ordinary. I believe that people are the most important, paper is just a lovely addition you can have fun with or completely indulge in if your heart so desires. I love nothing more than listening to my couples’ stories and their stationery ideas and turning them into pieces brimming with character and personal style. The main thing I would love to tell English Wedding Blog readers is that I’m proud of the diverse styles I offer: Emma Jo may be small but I have big ideas and am always exploring new concepts to give our couples more and better options. Coming from a design background, the quality of the designs is really important to me. My stationery features original artwork and a distinct typography style, printed to the highest standard on the finest cardstock. I’m a printer too (I have a degree in Surface Pattern and Print) so I handle the stationery from design to print room, so I offer a truly personal experience. Emma Jo offers a huge choice of print techniques from digital, flat printing to letterpress, foil as well as laser cutting to name a few! With the all new website revamp, I’m excited to launch five new designs as part of The Collection, suitable for all budgets, designed for couples to pick and choose the items they love and personalise them as they wish. Gold foil printing is super popular at the moment, but many couples only require small numbers of invites, are tight on time or simply don’t have the budget to go all out. So to offer a solution I designed ‘Little Gold Heart’ which has all the luxury of a specialist print with a metallic gold foil heart, but the option to have personalised, small quantities as I digitally print the rest of the design allowing much more flexibility. This is also a great affordable option compared with fully foiled or letterpress stationery. To celebrate five years of Emma Jo, alongside The Collection designs, I have launched the ‘Anniversary Ticket’. I’ve always had lots of requests for personalised prints so we now have a little framed, individually made ticket and to make it extra special I hand foil each one with a little gold arrow. For couples that want that next level of detail we also have a bespoke design service. I love to work on bespoke projects and the main focus of the website re-launch was to collate these designs and inspire couples who are looking for something a little extra special for their stationery. Have you found an amazing stationer you’d like to see featured on the English Wedding Blog? 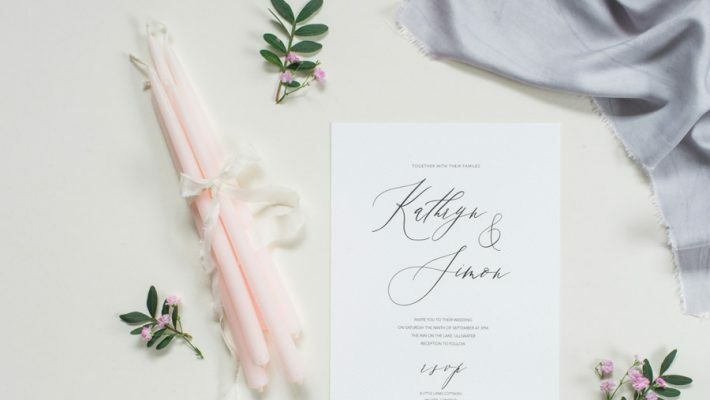 Are you a wedding stationery designer? Do you know any stationers who’ve just started out and might like a feature on a wedding blog? Please get in touch – I’m on the lookout for professional quality lifestyle photography of gorgeous, modern wedding invitations to share here. I’d love to hear from you and share your stories on the English Wedding Blog! 10% saving on wedding invitations this weekend!